There were two songs that came out from this "News of The World" album which became widely accepted themes all over the world. First is of course the frequently used "We Are The Champions" as sport anthem all over the world and second is "We Will Rock You" which has been used frequently also in sport or any event which creates motivation (in workshop, seminar, gathering, etc.). From these two facts, how could we say that this is not successful album? But it's not only that. 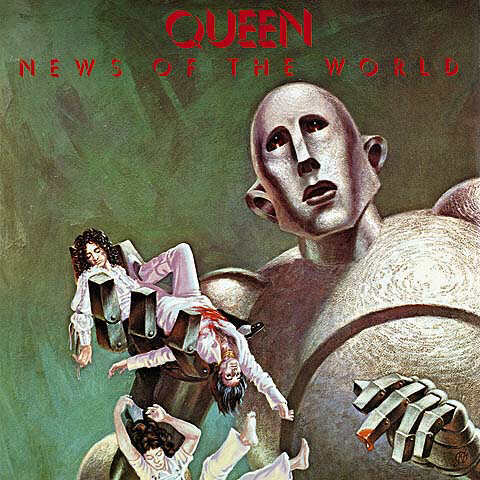 Musically, this album still represents the early sounds of Queen like in "A NightAt The Opera" even though "News of The World" is less attractive. There are good tracks like "Sheer Heart Attack" which has good power, the mellow "All Dead, All Dead" and the energizer "Spread Your Wings". The lyrics of "Spread Your Wings" is really good, and the music is very motivating to energize emotion.I also personally love "Fight From The Inside" which lyrically a very encouraging message with positive words and I also like the music. It's not the best, but it's a good album from Queen.